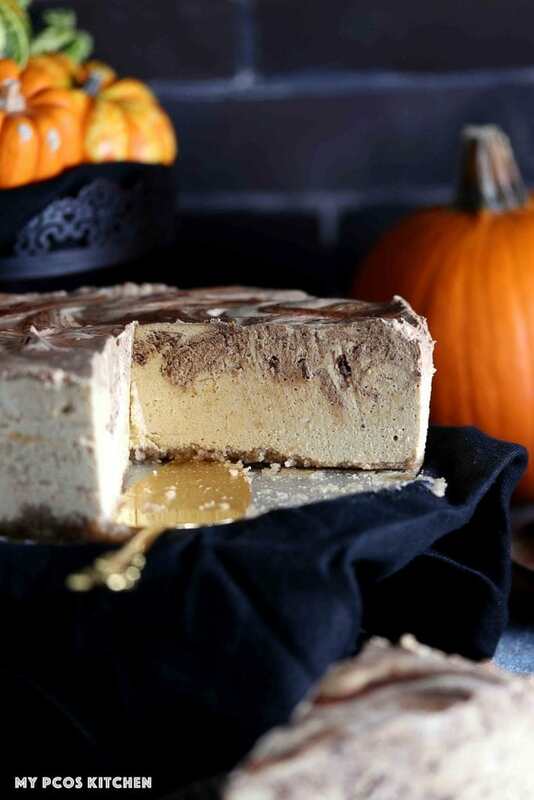 This delicious no bake low carb pumpkin cheesecake is completely sugar free and gluten free. Made with a combination of cream cheese, sour cream, heavy cream and a touch of gelatin, it’s the fluffiest and creamiest sugar free pumpkin cheesecake you’ll ever have! It’s finally fall which means that it’s pumpkin season! I’ve been waiting all year to make delicious pumpkin-themed desserts. We have the Canadian and American Thanksgivings, Halloween and Christmas coming up so I’ll be making lots of treats. I have so many low carb pumpkin desserts on the blog that I don’t know where to start! My favourite desserts have always been cheesecakes so I decided to make a sugar free pumpkin cheesecake that didn’t need to be baked because I already have a kabocha cheesecake version made with kabocha squash instead of pumpkin puree. This cheesecake has an easy almond flour crust and is topped with a creamy and fluffy no bake pumpkin cheesecake fluff. The spices for this recipe are quite simple as I just used some cinnamon and allspice. I also topped this low carb pumpkin cheesecake with some melted chocolate from lily’s, which is completely optional if you’d like to cut the carbs a little. For dairy free pumpkin desserts on the blog, I have a traditional pumpkin pie with an almond flour pie crust and dairy free pumpkin custard, some pumpkin whoopie pies that are also made with gluten free cookies and a dairy free cream filling, or some easy flourless pumpkin muffins that use almond butter instead of almond flour. For low carb pumpkin desserts that use some dairy, I have some keto chocolate chip cookies with pumpkin and an individual pumpkin mug cake that you can make when you just want a single treat. Mind you, both of these recipes can easily be made dairy free. 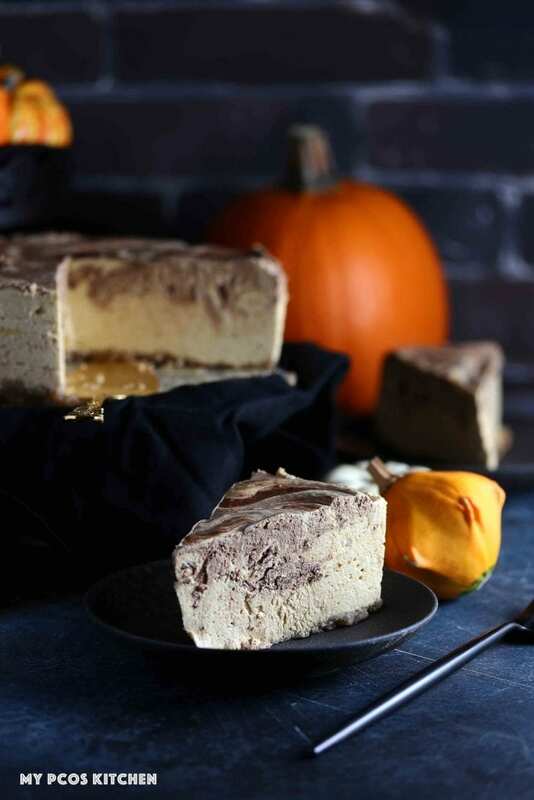 For this no bake pumpkin cheesecake recipe, I wanted to really focus on the cheesecake batter and not have a crust that overpowered the flavours of the pumpkin spice and pumpkin puree. I decided to go as simple as I could and just mixed a bit of almond flour and coconut oil together. For taste I added a bit of cinnamon powder and stevia powder for sweetness. You can use blanched almond flour or almond meal. Both are fine and work equally well. If you’d like to try a different type of low carb cheesecake crust, I suggest trying the one from my no bake raspberry lemon cheesecake. It’s made with pistachios, walnuts and almonds! I don’t usually put parchment paper at the bottom of a cheesecake springform pan, but you could always cut a circle and place it there in case you’re worried it might stick. The crust won’t stick, though, so you don’t have to worry about that. Once you’ve finished making the easy low carb cheesecake crust, you’ll move on to the main part: the cheesecake batter. Your first step is to whip the cream and sour cream together until nice and fluffy. Once whipped, you’ll want to add the pumpkin puree, sweetener and spices. Make sure to use unsweetened pumpkin puree as pumpkin pie filling has sugar added! You’ll end up with a smooth and creamy orange coloured fluff. Here you can taste test with your finger to see if the sweetener is enough. I think that 3/4 teaspoon of stevia was more than enough for this recipe, but our taste buds might be a little different. Once you’ve add the pumpkin puree and spices, you’ll want to add the heavy cream, a little at a time. It’s important that you slowly add it in or else the liquid might splash everywhere around the bowl. You’ll want to whip it for a good two minutes so that the heavy cream has time to fluff and double in size. The next step is to make the gelatin mixture. You’ll want to mix the boiling water with the gelatin powder. I used three envelopes which measured 15g and mixed it with 150ml of boiling water. This was enough water to melt the gelatin. I then poured it, slowly, into the cheesecake batter while mixing it with my hand mixer. Again, you’ll want to add the gelatin mixture, a little at a time, or else it’ll splatter everywhere. The final step was to make the sugar free chocolate swirl over the low carb pumpkin cheesecake. 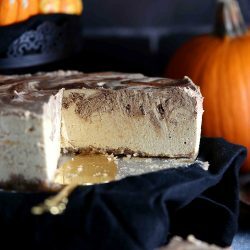 This step is completely optional, but I found that a bit of chocolate over this no bake pumpkin cheesecake made it look really good and it tasted much better. For this step, I added 56g or 4 servings of lily’s chocolate chips into a small bowl with some coconut oil. I then microwaved it for 40-50 seconds to melt the chocolate. I then stirred it with a spoon until all of the chocolate had melted. 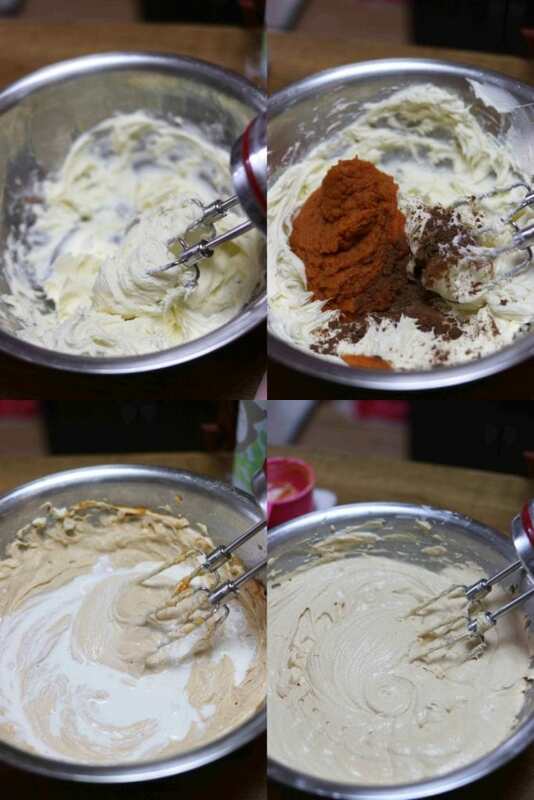 Finally, I just poured it all over the raw cheesecake batter and used a spoon to mix it in and create a swirl effect. I moved the spoon in circles, up and down, to try and bring the chocolate to the bottom too. Once that’s done, you only need to refrigerate it for a minimum of four hours in the fridge and it’s ready to serve! Mind you, this cheesecake makes huge thick slices so you’ll get filled right up after eating it. 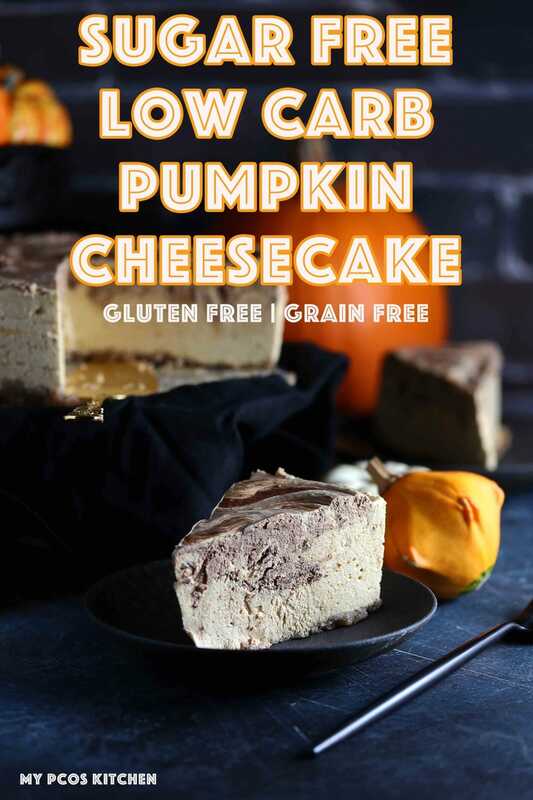 For some possible substitutions, please read the following tips when making your low carb pumpkin cheesecake. Instead of almond flour for the crust, you can use any other type of nut flours. If you’re allergic to nuts, you can sub for oat fiber, or coconut flour but please increase the oil amount by one or two tablespoons. Make sure to use pure pumpkin puree without any added sugar. Do not use pumpkin pie filling as that has added sugar. Instead of pumpkin puree, you can use kabocha squash or even sweet potatoes, but that will up the carb count. The sour cream is completely optional. I added it for extra creaminess and fluffiness. If you don’t have pumpkin spice, you can use 1/4 teaspoon of nutmeg, cardamon powder and ground cloves each. You can sub the stevia powder for pure monk fruit extract in equal amount. I don’t personally like to use erythritol in raw desserts as it leaves an intense cooling taste and gives me an insane headache immediately. The lily’s chocolate that I added over the cheesecake is also optional. I really like chocolate and pumpkin together, which is why I added it. But to cut a few of the carbs, you can leave it out. I used a 9 inch springform pan, but you can use any size pan whatsoever. It’s easier to use one with a loose bottom, though. Pro tip: Mix the gelatin powder in boiling water before incorporating it into the cheesecake batter. If not, you’ll get chunks of gelatin balls in your cheesecake! Pro tip #2: Make sure you add in the heavy cream and gelatin mixture, a little at a time. If not, the liquid will splatter everywhere! Let it cool in the fridge for at least 2 hours as you want the gelatin to set properly. If not, it might be a little hard to slice as the pumpkin cheesecake will be too soft and will be more like a pumpkin cheesecake mousse. 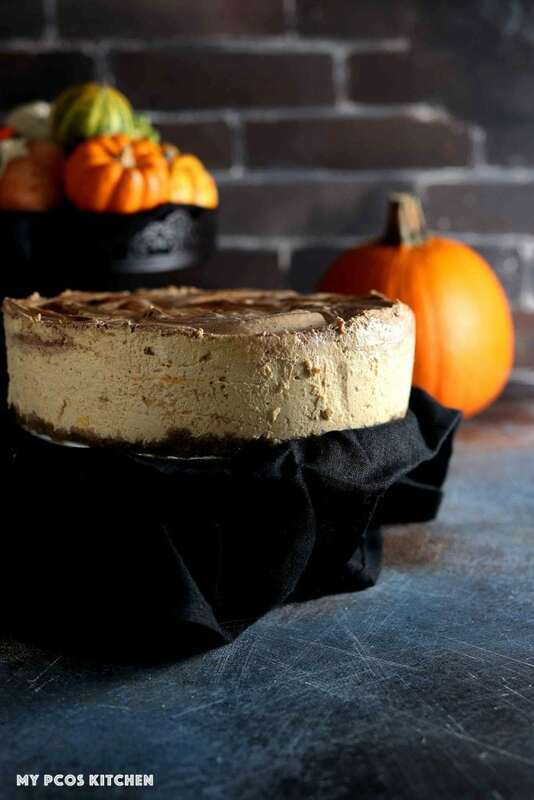 A delicious no bake pumpkin cheesecake full of flavour! 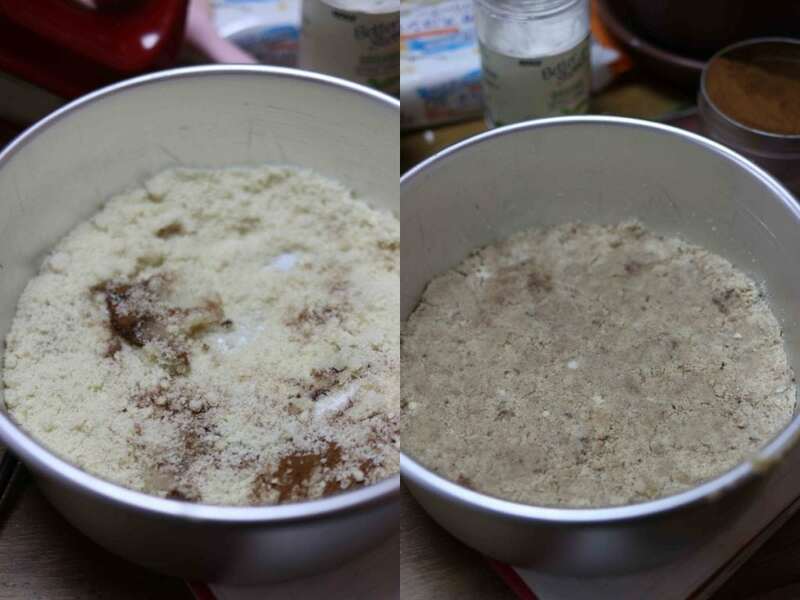 In a medium bowl, mix the crust ingredients together until crumbly. With your hands, press together and the oil and nuts should stick together. Transfer the crust ingredients onto a 9 inch springform cheesecake pan with a loose bottom. With a spoon, evenly spread the crust onto the bottom to make a crust. In a large bowl, whisk together the cream cheese and sour cream with a hand mixer. Add the pumpkin puree, stevia, cinnamon and allspice. Mix together until there are no more bumps. Add the heavy cream, a little at a time, and whisk for 2-3 minutes until thick and fluffy. Mix the gelatin and hot water together in a small bowl. Stir with a spoon until all of the gelatin has melted. 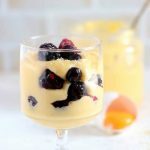 Pour the gelatin mixture, a little at a time, into the cheesecake batter and whisk again until all of the liquid has been incorporated. Pour the completed cheesecake batter over the crust in your springform pan. Spread evenly. OPTIONAL STEP: Add the lily's chocolate chips to a small bowl with the coconut oil. Microwave 40-50 seconds and start mixing with a fork or spoon until all of the chips have melted. 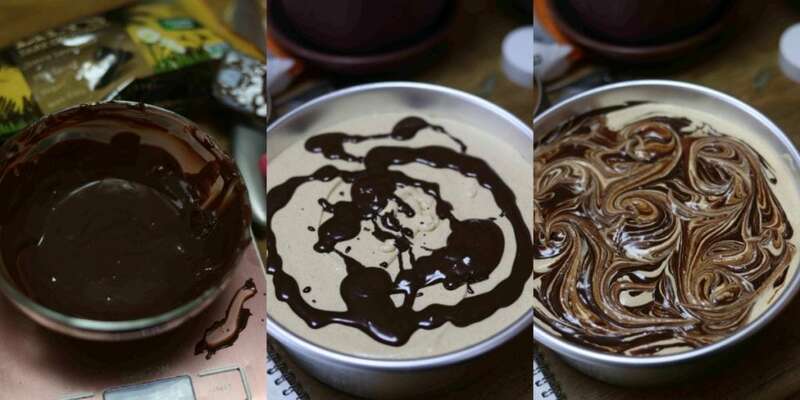 Pour onto the cheesecake batter and with any utensil, spoon/knife/fork, make swirls, pushing the chocolate at the bottom. Once the chocolate is all swirled up, cover the cheesecake pan with saran wrap and chill in the fridge for minimum 4 hours. Once it's set, take it out of its mold and serve as is or with some whipped cream or caramel sauce. You can sub the almond flour for any other kind of nut flours. You can sub the stevia powder for pure monk fruit extract. You can sub the coconut oil for any other type of oil/fat like butter, ghee, shortening, lard, etc. If you don't have allspice, you can use 1/4 teaspoon of nutmeg, cardamon powder and ground cloves each. Make sure to add the gelatin to the boiling water BEFORE adding it to the cheesecake batter. Pour the heavy cream and gelatin, a little at a time, or else the liquid will splash everywhere. I’m sorry to be a pain, but I can’t seem to use my conversion chart on my phone, I’m kind of lame when it comes to things like that. Is there anyone that can finish converting the rest of the ingredients for me? Please. I really want to make this for Thanksgiving. Cream cheese is the first ingredient of the recipe. If you click US IMPERIAL, it converts the whole recipe. Ok.. I just saw the cream cheese listed when I printed the recipe. That threw me at first. 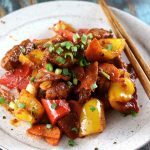 How many carbs per serving, using your exact recipe ? Am I mistaken, I don’t see cream cheese in the cheese cake? Did I miss it? It looks amazing, but I must have missed seeing it? Hi Mira! 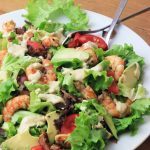 This recipe was another great hit! I love this recipe. The only thing I’m going to do different next time is maybe melt a bit of erythritol into the boiling water used for the gelatin to sweeten it up a bit (crazy “sweet” tooth here 😆). Do you think that will incorporate the erythritol correctly? Thanks for another delicious recipe! I personally don’t usually add erythritol in no-bake cakes as it doesn’t dissolve perfectly. Your method may work, have never tried it, but it might give it an extra bit of grainy texture. I personally would just add more stevia or monk fruit powder to make it sweeter. I would appreciate it if you stuck to one type of measurement in stead of using both metric and standard English measurements. What are you talking about? I use metric and people can convert it to imperial if they click imperial.